Osada Vida, one of the most interesting Polish bands on the prog-rock scene, release in early June their first live DVD. In anticipation for the “Where The Devils Live” DVD, the band prepared a surprise for all their fans. A documentary “3 hours to the show”, showing what is happening on stage three hours before the concert, is now available on YouTube in THIS location. 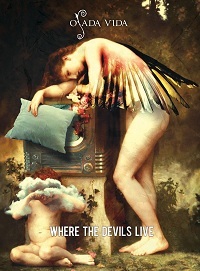 “Where The Devils Live” DVD features the recording of their live appearance at the Wyspianski Theater in Katowice, Poland in November 2011. Outstanding performance and intriguing visuals make for an exceptional and deeply engaging spectacle. Richly diversified track list features songs from all previous albums, as also a previously unreleased song “Hard-Boiled Wonderland”. The DVD also includes an interview with Łukasz Lisiak (vocals, bass) and Rafał Paluszek (keys). Metal Mind Productions set the release date for June, 18th in Europe and July, 24th in USA (via MVD). Osada Vida’s discography includes three demos and three well received official releases – “Three Seats Behind a Triangle” (2006/2007), “The Body Parts Party” (2008), “Uninvited Dreams” (2009). Their albums feature elaborately beautiful music in the vein of Yes, Porcupine Tree, Pain Of Salvation and Riverside.